How often do you use your smartphone? 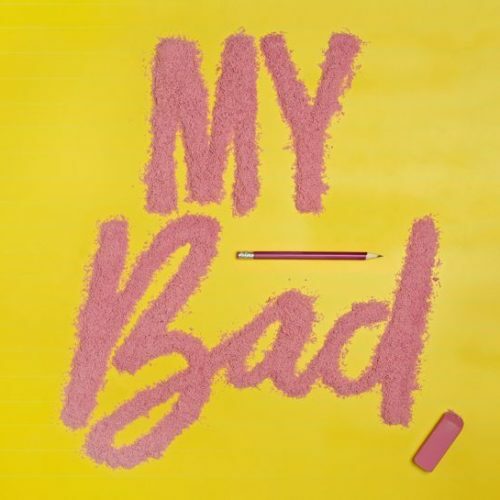 Do you remember how helpless you felt the last time when your smart device was left at home? Smartphones have become indispensable parts of our lives. We check out the news feeds in social media at breakfast. We read the latest news on the media portals on the way to work. Also, we chat with friends in messengers each time we have a spare minute. Moreover, we spend hours searching the web on-the-go. Finally, we choose only the fast-loading sites. The ones that make us too long to wait until the content loads are quitted immediately. 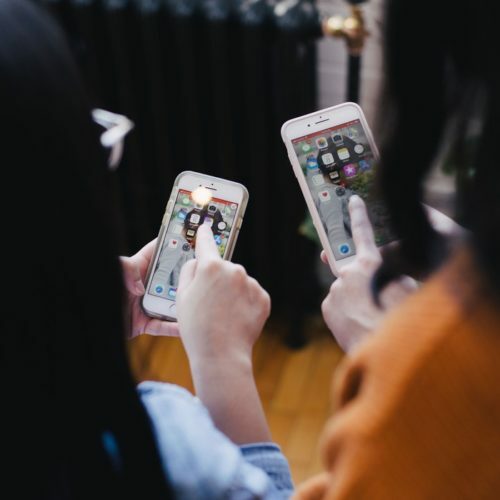 In order to attract the wider audiences and keep people coming back, the modern day businesses need to take care of the proper performance of their sites on all devices and the screens of mobile phones in particular. Today we’re introducing AMP-ready Magento themes from TemplateMonster Marketplace. AMP (or accelerated mobile pages) is a module that is intended to make the content of the websites load quicker on the smaller screens. Having it installed on your site, you will impress the web users with the lightning fast page loading speeds, as well improve your search engines rankings. If you run a Magento-based eCommerce site and want to boost its performance on the handheld devices, then the AMP module is just what you need. AMP controls the entire load chain. It prioritizes the main content on the web page by loading it first, with the third-party content being loaded afterward. attain up to 10% traffic growth and 52% sales boost. TemplateMonster is the first digital marketplace on the market that started to sell AMP-ready Magento themes. At the moment, there are 6 Magento themes that are integrated with the technology. All consecutive Magento 2.2 themes will be loaded with the module also. 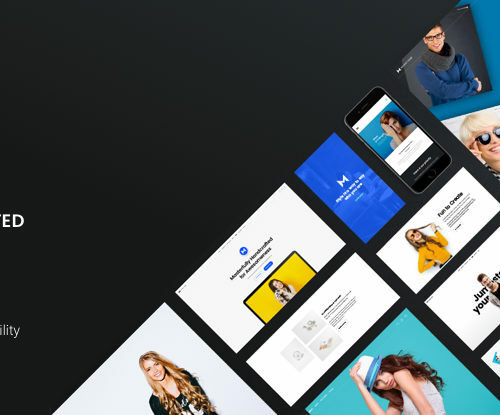 Fine-tune your website design and style using this multipurpose Magento theme that has an aesthetically appealing palette. 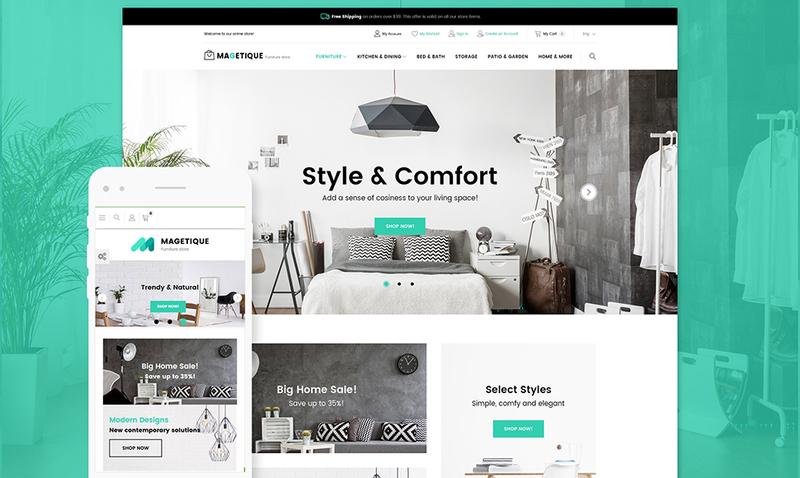 Magetique is a cool theme created to get fashion, furniture, tools, cars, and other types of projects to the web. Its 100% responsive structure will look perfect on any monitor size. AMP technology will ensure lightning fast page loading speeds. Putting up a web platform is definitely beneficial for advertising these days, and this design can play an important role in the arrangement of your online marketing strategy. Moreover, a lot of template settings can be changed on the fly through the advanced admin panel. Neat and well-organized design of the web template allows you to promote loads of content on one web page, without diminishing its legibility. In addition, buying this particular template you get round-the-clock technical support and detailed guidelines. 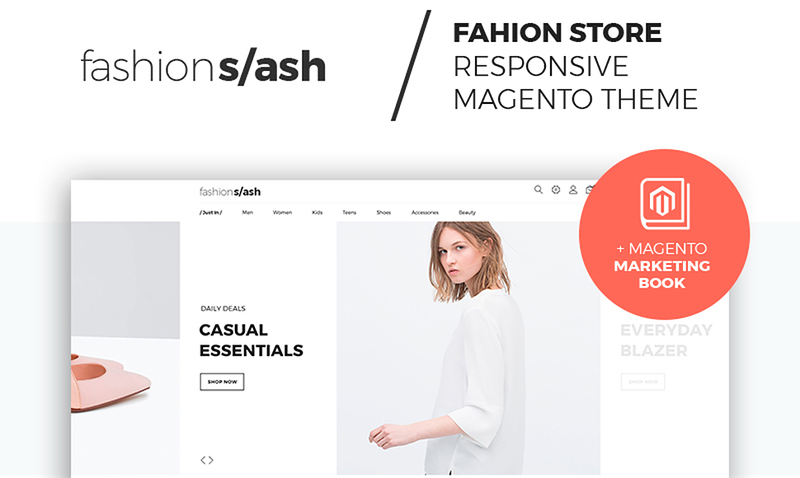 Fashion Slash is a fashion and beauty shop theme designed for bringing your website on the net. This theme is an advanced solution for small to large-sized eCommerce projects. Moreover, included blocks of content and widgetized elements make the design of the template clear. Setting up a web resource and granting your prospective customers an opportunity to check out the information concerning your project on the move can be a wonderful method of raising your client base. Additionally, easy-on-the-eyes page layout with the focus on visuals easily catches the attention of site visitors, driving them in. The most impressive thing about this template is the design. 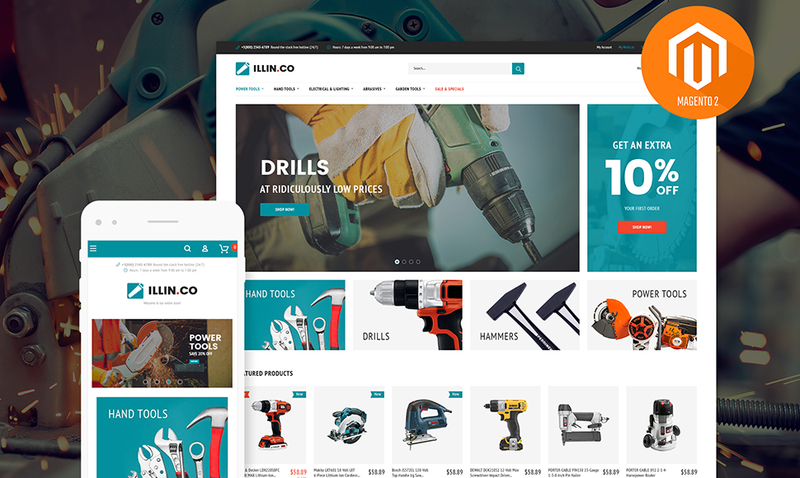 Well crafted 100% responsive website design with a robust visual impression will wonderfully work for redressing or putting up tools and equipment web stores. Regardless of the gadget, you have to browse the webpage, its interface will display flawlessly because of the built-in AMP technology. Thus, the website visitors will definitely love this navigation and graphic elements that guide them swiftly throughout the site. Create your online resource even more productive with this custom WordPress skin. In the event of any problem with this template, you can contact one of the professional assistance managers and they will resolve the problem of any difficulty for clients. This jewelry Magento theme is a good solution to present any sort of fashion-related eCommerce project. Easy-to-use site navigation and easy-to-browse, responsive and cross-browser compatible design will facilitate the visitors’ interaction with the website based on this theme. SEO-optimized, it can be easily found by the web users whichever search engine they are making use of. Magento is already a powerful option equally for personal and business sites, and with this layout, it will turn out to be twice more effective to launch your eCommerce project. Moreover, responsive design offers an ideal user experience. Furthermore, the website created on the basis of this web template will result in the enjoyable browsing and make buyers interested in your deals. This designer web template comes with a graphic-heavy layout great for a stunning presentation of your web-based project. This website template is quite suitable to present your photo portfolio, freelance photographer portfolio or fashion photographer on the net. Being integrated with popular social networks platforms, the template shown here can be an ideal tool to get in touch with your clients. Moreover, multipurpose and easy to change, the web layout can be comfortably adjusted to demonstrate your website at its top. Furthermore, this 100% responsive theme is a practical solution with nice typography and well-balanced blocks of content. To convert electronics store site into a progressive and pleasing one, think of this vibrant straightforward Mobile Store Magento 2 Theme. 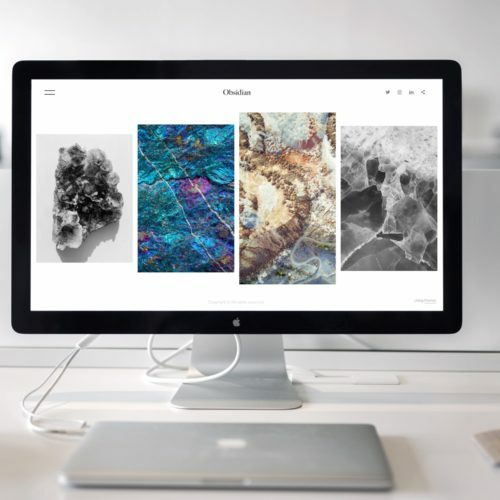 This particular photography portfolio Bootstrap web theme that can be used to get started with an online resource for mobile and tech gear eCommerce projects. Thus, if you want to build a successful online resource with Magento, you have to use a powerful and fully-fledged website template, supporting specific forms and plugins. Intuitive navigation and 100% responsive design of this theme offer the web page visitors a pleasant user experience. AMP module will enhance the performance of the site in all web environments. The Magento 2 web template is a smooth and cutting-edge design for photography auto parts shops. In other words, it is a combo of visual aesthetics and features. SEO-optimized, it can be easily found by Internet users whichever search engine they are making use of. 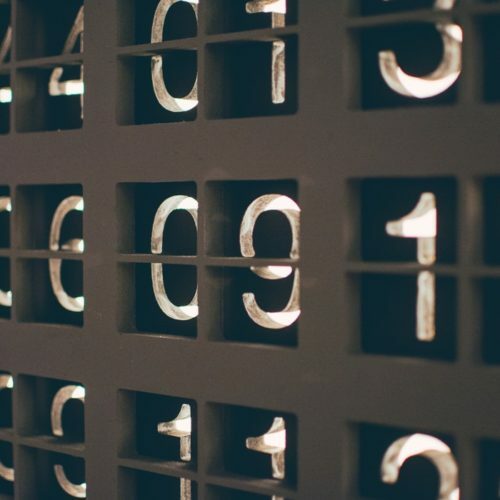 Don’t overlook this theme if you aim at maximizing your web recognition. Responsive layout is one more reason to try this web design for your web store as it performs equally well on any screens including PCs, tablets and mobile phones. And as a result, a lot of people can easily get to your webpage from their handheld gadgets. In addition, a welcoming customer assistance squad is available 24/7 for free. Select this web theme and spread the word of your e-project all over the world. Get your website off to a flying start by using this theme. Pay attention to this template that was tailored to build or redesign your furniture or interior design eCommerce site. Presented blocks of content, widgetized sections make the structure of the theme distinct. Moreover, a lot of template settings can be changed on the fly through the usable admin panel. Make every client feel the delight of surfing your Internet site using this theme. Furthermore, the clients will smoothly browse around a thought-out web page, and view it on numerous mobile devices because of its 100% responsive, cross-browser compatible and SEO-friendly layout. Clean, valid code and comprehensive documentation will aid you in enhancing this web theme the way you desire. Make use of this web layout to persuade prospective web users that they will have a nice time browsing your website! This healthy food template is built by a team of qualified designers, therefore it will make any site work to its full potential. This innovative Bootstrap web design has been created to satisfy the needs of food delivery and supermarket sites. Visiting a website page based on this theme users will allocate the necessary content without problems. Moreover, thanks to its fully responsive essence, you will easily reach clients who surf the web on the move, whereas SEO-friendliness will let you boost traffic rates of your online project. Thus, if you want to build a successful online resource with Magento, you have to use a powerful and fully-fledged website template, supporting specific forms and plugins. AllyBike is a responsive cycling store web theme that’s been designed to run flawlessly across a wide range of devices and web browsers. Present the inventory in the usable style online to get the clients you were not able to engage in the past. Building a brand new project on the net, you need to ensure that it will stand above the rivals, which is when this theme will come to be useful. Included blocks of content, widgetized elements make the design of the template clear. Moreover, its well-arranged layout is effective for content-rich websites that need to present all specifics in an easy to perceive manner. The theme is also richly documented and provides professional 24/7 support. Start a thriving web resource by means of this web theme and get the gains. The Computer Store Magento Theme will easily draw the attention of online users to your products and services. 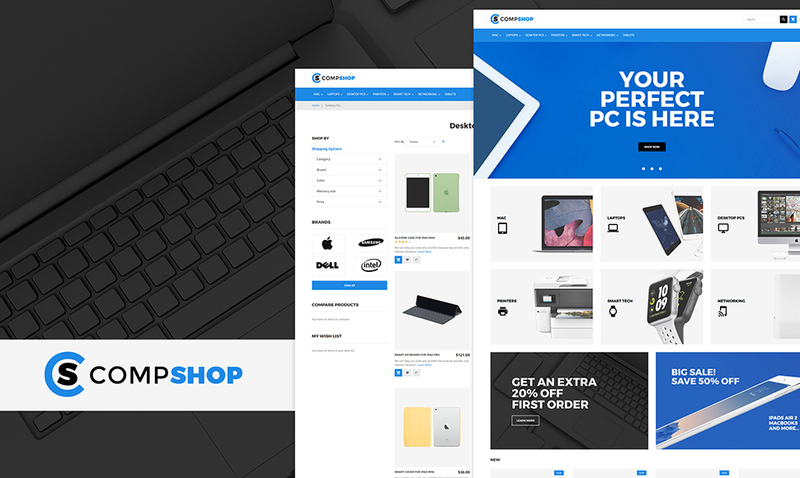 This innovative template was created to satisfy the needs of the needs of computers and Internet shops. The content areas help make the design user-friendly. If you’d like to present your webpage effortlessly, this responsive and SEO-friendly website template is going to be a splendid solution. 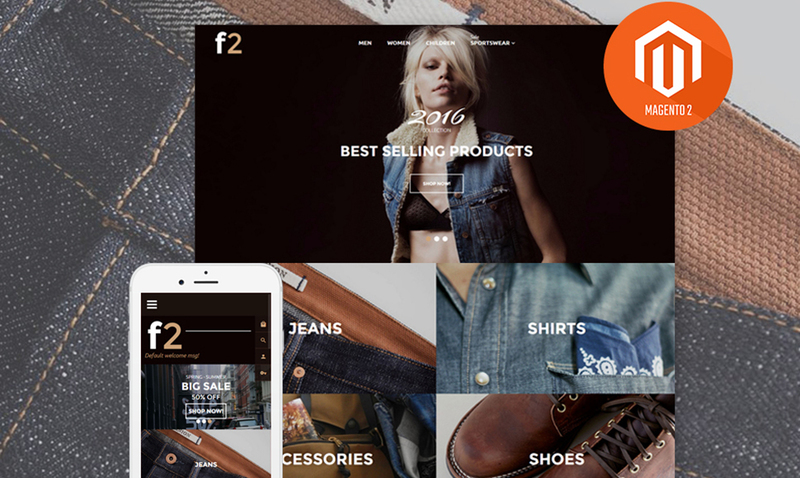 If you want to build a successful online resource with Magento 2, you have to use a powerful and fully-fledged website template, supporting specific forms and plugins. Thus, the great outcomes are achievable due to this theme’s SEO -friendliness, usable features and clear yet catchy design. In the event of any trouble with this website layout, you can get in touch with one of the well-trained support managers and they will solve the problem of any difficulty for you. 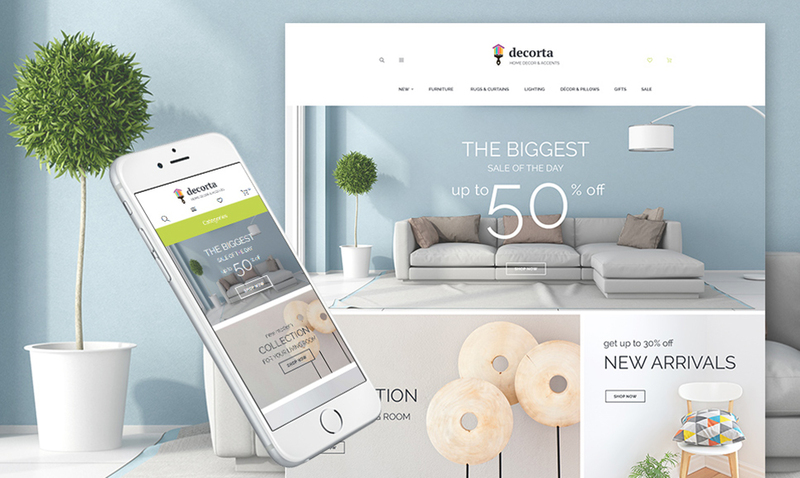 Decorta is a ready-made responsive home decor web template designed to present your products and services in the best way on the net. Advanced and responsive sites are the best way to present professional furniture and home decor services worldwide and boost interest among your target audience. Also, the content areas help make the overall design user-friendly. Being integrated with popular social networks platforms, the template shown here can be an ideal tool to get in touch with your clients. In addition, the vast majority of theme’s settings can be changed immediately through the usable admin panel. This design was developed as lightweight as possible so that your website can certainly load fast. The collection of the AMP-ready Magento themes will continue to grow. Do not miss the chance you accelerate the performance of your web resource throughout a variety of handheld devices. Present your offers in the more lucrative style to the wider web community.